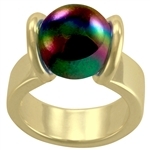 You can change the marble in this solid sterling silver ring heavy plated in 14K gold. 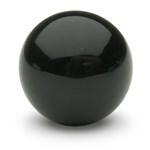 Just grasp the marble and pull it out! Choose a new color and get a whole new look. The patented tension mechanism holds onto the marble while you're wearing the jewelry, but then releases it when you change it. A Mod style setting with a flat band, perfect for making a statement. You'll love the looks you get! Includes the Itty Bitty Marble Set. Ring shown here with a Purple Jade Gem Marble, sold separately. Comes gift packaged in a white Got All Your Marbles? Box with instructions, polishing cloth and a Itty Bitty(10mm) marble set of 10 glass marbles.